Review by AllTheBestFights.com: 2019-04-20, pretty good fight between David Allen and Lucas Browne: it gets three stars. David Allen entered this fight with a professional boxing record of 16-4-2 (13 KOs=81%) and he is ranked as the No.47 heavyweight in the world. He lost to Tony Yoka last year (Tony Yoka vs David Allen) but then he has won over Nick Webb, Samir Nebo and Ariel Esteban Bracamonte. His opponent, the former Wba Hw champion Lucas Browne, has an official record of 28-1-0 (24 KOs=86%) and he entered as the No.26 in the same weight class. He also lost once in 2018, against Dillian Whyte (Dillian Whyte vs Lucas Browne), but then he has beat Julius Long, Junior Pati and Kamil Sokolowski. 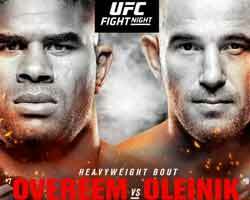 Allen vs Browne is the main event of the evening. Watch the video and rate this fight! 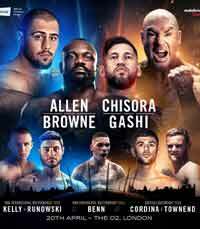 Review by AllTheBestFights.com: 2019-04-20, some good exchanges between Josh Kelly and Przemyslaw Runowski but it is not enough to get three stars: it gets two. Both undefeated, the former Olympian Josh Kelly entered this fight with a perfect record of 8-0-0 (6 KOs=75%) and he is ranked as the No.25 welterweight in the world while his opponent, Przemyslaw Runowski, has an official record of 17-0-0 (3 knockouts) and he entered as the No.110 in the same weight class. In their last three bouts Kelly has won over Carlos Molina (Josh Kelly vs Carlos Molina), Kris George (Josh Kelly vs Kris George) and Walter Fabian Castillo (Josh Kelly vs Walter Fabian Castillo) while Runowski has beat Alain Chervet, Twaha Kiduku and Siarhei Huliakevich. Kelly vs Runowski is valid for the WBA International welterweight title; undercard of David Allen vs Lucas Browne. Watch the video and rate this fight! Review by AllTheBestFights.com: 2019-04-18, pretty good finish between Umar Salamov and Norbert Dabrowski but the rest of the fight was quite boring: it gets two stars. The former Ibo light-Hw champion Umar Salamov entered this fight with a professional boxing record of 23-1-0 (17 knockouts) and he is ranked as the No.19 light heavyweight in the world. He lost to Damien Hooper in 2017 but then he has won four bouts beating Denis Liebau (Umar Salamov vs Denis Liebau) and Emmanuel Anim in his last two. 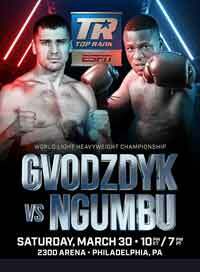 His opponent, Norbert Dabrowski, has an official record of 22-7-2 (9 knockouts) and he entered as the No.39 in the same weight class. He was defeated by Robert Talarek in 2017, but then he has beat Oleksandr Haraschenko, tied with Jordan Kulinski and taken revenge on Talarek. 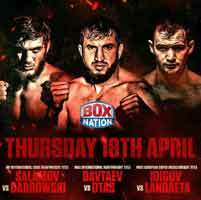 Salamov vs Dabrowski is valid for the WBO International light heavyweight title. Watch the video and rate this fight! 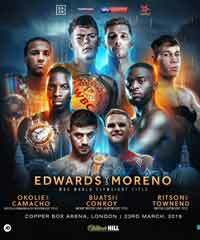 Review by AllTheBestFights.com: 2019-03-23, fight not particularly good between Lawrence Okolie and Wadi Camacho: it gets two stars. 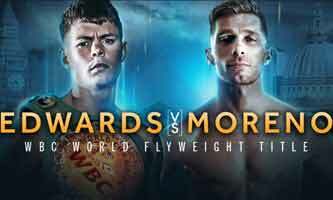 Review by AllTheBestFights.com: 2019-03-23, good fight between Charlie Edwards and Angel Moreno: it gets three stars. Review by AllTheBestFights.com: 2019-03-30, disappointing fight between Kudratillo Abdukakhorov and Keita Obara: it gets two stars.